The Ease, Beauty And Benefits Of Growing Marigolds In The Garden! When it comes to adding an explosion of color to the landscape, its hard to beat growing marigolds. From giant blooming “puff-ball” styles to dainty miniatures, and everything in between, there are well over 50 varieties of marigolds available. And with their high tolerance to both sunlight, drought and heat, it’s easy to see why they have long been a go-to choice when planting flowerbeds, containers, hanging baskets and more. Marigolds can add more than just beauty to your garden and landscape. But beyond their bright blooms, marigolds have some pretty amazing additional benefits when grown in or near vegetable gardens. Benefits that can help defend against pests and disease, and lead to a more productive harvest. Heading up the list of benefits is the ease with which marigolds can be planted. Marigold seeds are easy to save, and easy to plant. Although marigolds can be grown and planted as transplants, there is simply little need to do so. Marigolds seeds are among the easiest to plant, and the fastest to germinate. In fact, once the soil has warmed, they can sprout in as little as 3 days. And within 6 to 8 weeks, be thriving and blooming in full color. Adding to their allure, marigolds will grow in almost all soil conditions. To plant, simply sow seed 1/8 deep. Cover lightly with soil, water in, and you are all set. French marigolds growing in the garden. Among the various varieties to grow, Giant Crackerjack Marigolds and French Marigolds are two of the top favorites. 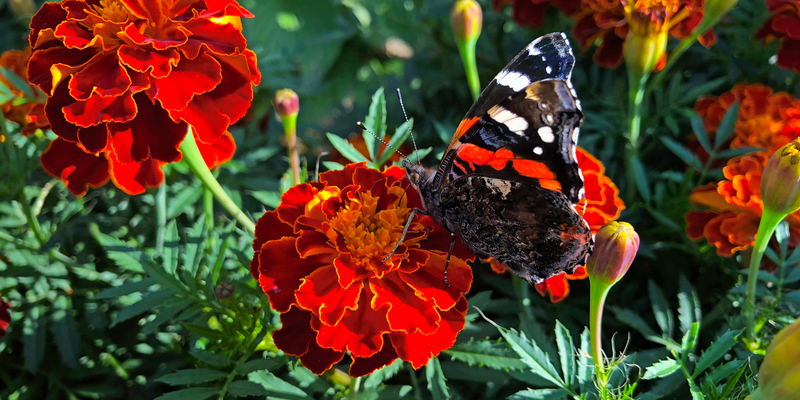 Marigolds bright blooms are wonderful for attracting some of natures best pollinators. And attracting pollinators to the garden means a better chance for more fruit and vegetables. Marigold blooms attract a whole host of beneficial insects to the garden and landscape. Honey bees, butterflies, moths and wasps are all attracted to marigolds. And all work their magic with vegetable crops as well. Nematodes can be quite the destructive in the vegetable garden. And marigolds are a great first line of defense against these unwanted pests. These soil borne enemies feed on the roots of tomato, pepper and various other vegetable plants. Nematodes feed on the roots of vegetable plants, causing serious damage to crops. As they feed, they slowly drain and deplete energy from the plant. In the process, the roots decay, and the plant weakens and ultimately dies. But the roots of marigolds produce a chemical that is toxic to nematodes. And when planted near or in the vegetable garden, can protect plants from these devastating pest. Beyond their known abilities to attack nematodes, marigolds have long been thought by many gardeners to be a natural repellent against all kinds of additional pests. Marigold are thought by many to help deter tomato hornworms. Marigolds pungent scent is said to help deter everything from tomato hornworms, squash bugs and cabbage worms, to rabbits, deer and squirrels from feasting in the garden. Just all the more reason to plant a few of these beautiful annuals in your garden this year!